I like Hallmark movies because they always end well, but that’s Hallmark, not life. As much as I would like Christmas to be neat and no needles on the floor, it isn’t reality. There have been Christmases in my family where gifts were thrown out with the wrapping paper. A bummer! There have been toys that didn’t work right out of the box, and macaroni that was too soupy and turkey overcooked and dry. There have been too many deaths. One family member’s funeral was on the day after Christmas. The death was sudden and shocking in many respects. The death occurred at a paramour’s house. The spouse was greatly disturbed by this and made sure that our kindhearted United Methodist minister was upstaged by a fire and brimstone preacher of a denomination that focused more on guilt than grace. Every other funeral in our family was pretty generic. But, since the spouse had the unkindly preacher dwell on adultery in his comments, for the first time in many funerals, we knew exactly who was in the casket. It was the truth, but it didn’t need to be said. Payback makes for interesting actions. In the case I’m remembering from Christmas long ago, said spouse was finally “laid to rest” beside the wandering partner. The son of the wanderer made sure that the so-called “rest” didn’t last long, had the person uprooted and the person’s name excised from the granite marker, and his own name inscribed instead. Now, that’s payback. That was a tough Christmas. We have all had them, and we all need more grace than guilt. Who has the moral high ground to denigrate someone else to the nether regions? Except for the grace of God, there go I. Every time I point my finger at someone else, the majority are pointing back at me. Can’t we cut everybody some slack – especially at Christmas? Nobody ever knows the whole story anyway. The wonder and mystery of Christmas is that God knows the dirt on everyone, and still chooses to become one of us, live our lives, die our deaths, and rise so that we might rise, too. Sometimes in our fictionalized versions of Christ we make Jesus so majestic and powerful that He can’t identify with us in our weakness. This is much like Aslan the Lion in C.S. Lewis’ The Chronicles of Narnia. Hear Aslan roar, but Aslan does die unjustly and the sacrificial stone is cracked, and he is finally resurrected. Aslan is still on the move today if we will notice the underdogs more than we do the magnificent. Many have heard the story of Barrington Bunny. Perhaps you’ve heard it on Christmas Eve or Christmas Sunday. I almost want to say that I’m sorry that you did because the telling of it can become a preacher’s ploy to play to the “Chreasters,” you know, the Christmas and Easter folks who only come to church twice a year. That is so unfair and such a guilt trip. Thank God for the people who come on the high and holy days. At least they come then. Some of the best people I know are the unsung people who can only muster the time, good health, or energy to get here on Christmas and Easter. You are welcome to come whenever you can. I’d rather assume that you have good reasons, not bad ones, for your choices. Nevertheless, you can find solace from the story of another underdog who gets the connection between Christmas and Easter and reminds us of Jesus. When most of us want Hallmark and perfect gifts and perfect lives, God dares to say to everyone, “It’s alright if the gifts don’t fit, aren’t age appropriate, or the food is a disaster.” Barrington Bunny is your hero, or, at least one of them. Barrington is the only bunny in the forest and enjoys hopping about in the snow, perennially looking back to see his hippity-hop designs. 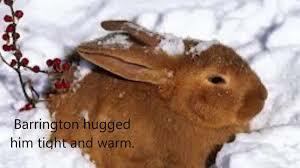 He’s furry and warm, but he’s feeling all alone at Christmas, and doesn’t feel gifted or special at all. He hears squirrels chattering up in a tree and asks what they’re doing. They are having a Christmas Party. He wants to join them but can’t since Barrington can hop, not climb. He hears the sounds of joy coming from a beaver’s home as their family celebrates Christmas. Barrington invites himself to the frivolity but isn’t able to swim to get inside. He is so sad. No parties, no family, just hippity-hop, hippity hop, and then he gets a visit from a great silver wolf. The wolf offers Barrington encouragement and tells him that all of the animals in the forest are his family, and that Barrington does have gifts to share. Then the wolf disappears, and Barrington decides to give gifts to his forest family. He puts a stick and note at the beaver’s saying, “A gift from a member of your family.” He scratches through the snow to find leaves and grass to make the squirrels’ nest warmer and again attaches a note, “A gift from a member of your family.” The wolf’s encouragement gives newfound purpose and family to Barrington. However, a blizzard is brewing. Snow piles up and Barrington barely hears above the howling wind the small sound of a baby field mouse. The mouse is lost and freezing, but Barrington tells him that his fur is nice and warm and that he will cover the mouse and provide shelter. Barrington has two thoughts, “It’s good to be a bunny who is furry and warm. It’s also good that all the animals in the forest are my family.” The next morning the baby mouse’s family finds him alive and warm under the sadly dead body of Barrington Bunny. On a cold winter night in Judea we were all given a gift that tells each of us that we’re a part of the same human family. God’s love is as sacrificial as Barrington’s. His gift to us cost Jesus his life when he grew up. May we love others as much and always be charitable. We all need it even if we don’t deserve it. Only God knows the whole story that connects you and me to both Christmas and Easter. What is your gift and who is your family?